On reaching coastal waters on their route back from the Atlantic, the fish had to pass several salmon farms in Loch Roag. On-farm sea lice numbers have risen this summer and many dead farmed fish have been taken onshore for disposal. The Blackwater River flows into Loch Roag on the west side of Lewis. At the end of July many dead, dying or distressed adult wild salmon were found in the tidal section of the lower part of the river. These wild salmon were smothered with many hundreds of sea lice. There is extensive and graphic photographic and video evidence, showing the extent of the infestations and how the sea lice have eaten away the skin of the fish. All badly damaged fish will eventually die. Blackwater River wild salmon, on their return journey from the Atlantic, must pass through Loch Roag where there are seven salmon farms, all operated by The Scottish Salmon Company (TSSC). Lice breeding on the hundreds of thousands of farmed fish in Loch Roag will have released unimaginable numbers of juvenile lice into the waters of Loch Roag to infest wild fish. Clearly the fish farmers have had a serious problem this summer. Numerous special waste skips full of dead fish have been leaving from Loch Roag over the last two months with tankers transporting fish carcasses to North Uist for disposal by burial in sand dunes. 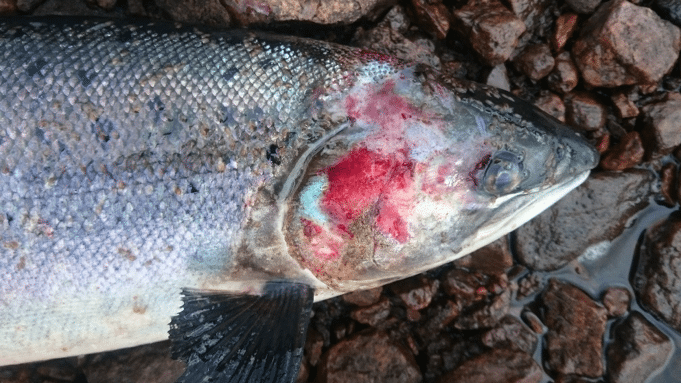 “We believe that the explosion in lice numbers on the Loch Roag farms, spreading out into the wider sea loch environment, has had deadly implications for wild fish, as they were waiting to enter the Blackwater. As the video shows, these fish were literally eaten alive and a large number of adults, that would have bred in the river, have been killed by the lice. “This episode represents exceptionally strong evidence of how lice on fish farms, where many hundreds of thousands of fish are packed close together in cages, can increase rapidly in number and release vast numbers of juvenile lice into the surrounding waters. This can have absolutely devastating consequences for wild fish populations. The loss of a very substantial proportion of the Blackwater River adult salmon run this year has severe implications for spawning and thus future salmon numbers. Furthermore, if sea lice numbers were high during May and June, then migrating wild juvenile salmon are likely to have been badly infested, compromising their survival chances. “As the Scottish Parliament’s Environment and Rural Economy Committees have both heard this year, the law is insufficient to protect wild fish from this sort of event. We desperately need MSPs to act quickly to plug this gap in Scottish law. Currently, there is no regulatory body that is responsible for protecting wild salmon from the impacts of salmon farming and so one of Scotland’s most iconic species is under serious threat. The Fish Health Inspectorate has been to the Roag farms, but the law means it is only able to involve itself in the health and welfare of the farmed fish, though the truckloads of mortalities that have been seen suggest that it has not been very successful. The Blackwater River, historically one of the most prolific salmon rivers in the Outer Hebrides, flows into Loch Roag on the west side of the Isle of Lewis, near the Callanish Standing Stones. The Scottish Salmon Company (TSSC) operates all seven salmon farms in Loch Roag. The parent company is TSSC PLC, registered in Jersey. The largest shareholder (with 72%) is SIX SIS AG, a Swiss company. Just what is the problem with sea lice? Adult wild salmon are perfectly adapted to coping with a few sea lice. Background levels of these parasites occur naturally in the sea. However, the advent of salmon farming, particularly in fjordic or largely enclosed sea lochs, has led to a fundamental change in the density and occurrence of sea lice in parts of the coastal waters of the west Highlands and Islands. Carrying an unnaturally high burden of sea lice is known to compromise severely the survival of juvenile migratory salmonids. Lice feed by grazing on the surface of the fish and eating the mucous and skin. Large numbers of lice soon cause the loss of fins, severe scarring, secondary infections and, in time, death. S&TCS’ formal petition to the Scottish Parliament in 2016 has led to first the Petitions Committee, then the Environment, Climate Change and Land Reform (ECCLR) Committee, and finally the Rural Economy and Connectivity (REC) Committee examining the problems that the salmon farming industry in Scotland is experiencing on-farm and causing to the wider marine environment, including wild fish. The ECCLR Committee report issued earlier this year agrees with S&TCS that there are significant concerns over impacts upon wild salmon and sea trout in the aquaculture zone of the west coast and in the western and northern isles of Scotland. S&TCS understands that the report of the REC Committee into salmon farming in Scotland will be published in the early autumn. “There appears to have been too little focus on the application of the precautionary principle in the development and expansion of the sector”. “If the current issues are not addressed this expansion will be unsustainable and may cause irrecoverable damage to the environment”. “The Committee is deeply concerned that the development and growth of the sector is taking place without a full understanding of the environmental impacts”.